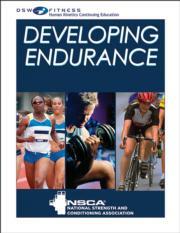 Developing Endurance by the NSCA facilitates the development of endurance training programs that maximize performance and minimize injuries. Runners, cyclists, swimmers, rowers, triathletes, and ultradistance athletes must sustain performance at a high level to come out on top. Using the information in the Developing Endurance course you can help athletes achieve optimal stamina through science-based aerobic, anaerobic, and resistance training. Describe the physiology of endurance activity and the factors that contribute to endurance. Define the principles of endurance training and effective endurance training program design through periodization. Use a variety of testing and assessment tools to evaluate endurance and measure the effectiveness of endurance training programs. Define the principles of proper nutrition and hydration for endurance sports and activities. Design safe and effective endurance training programs to meet specific goals for a variety of endurance sports and activities. Identify a variety of endurance and resistance training drills, exercises, and training plans to maximize health and fitness as well as competitive performance. The Developing Endurance Print CE Course is an invaluable resource for strength and conditioning professionals seeking to help clients perform to their potential.